Over the past decade, there has been a marked shift towards businesses of all sizes using coworking in addition to serviced offices worldwide, particularly in the UK, and that trend is set to expand at a rate of 20% year on year. In fact, London is the global capital of coworking, followed by New York and, according to Statista, there are now over 18,900 space-sharing locations around the world. To give a sense of how rapid this expansion has been in London, coworking provider WeWork now has the second largest commitment to office space in the capital after the UK government. As a result, it’s expected that 10% of all commercial office space will be coworking by 2028 and that new building tenants will be required to offer coworking and serviced options as part of their leasing arrangements, strongly suggesting that now is the time to start planning how coworking will form an important element of your Corporate Real Estate strategy. Mobile technology has made the world smaller and more connected; staff can either work from home, from the office or from a designated coworking space with equal ease and still achieve the same high levels of productivity, making this is a key driver towards shared space modelling. One of the key appeals for big businesses is that coworking by its very nature promotes knowledge sharing, collaboration and a more open approach to problem-solving. Creative environments stimulate fresh ideas, highlighting different ways of gaining a competitive advantage, and the cumulative effects of many incremental benefits gained in dynamic workspaces can translate into significant improvements across a large corporation. Rather than thinking in terms of permanent physical desks, corporate businesses are starting to adopt the more fluid options that coworking offers. Businesses are moving away from the idea of accommodating all their staff at head office. Instead, they can take space nearer to, say, their key customers or new markets so some of their team members can be based closer to their clients when they need to be, while others can work from home. Coworking makes better sense and uses fewer resources, but companies are also saving on non-productive travel time, reducing their carbon footprints and improving their corporate environmental credentials. Nevertheless, these companies are still as successful, however coworking means they’re now using less space, their workforce is more mobile and their traditional fixed cost overheads are considerably lower. From a contractual point of view, long term commitments are no longer of prime concern; what is important is that coworking spaces are in the right location, that they’re fitted out to a high standard and that they offer more flexible business options. In addition, businesses adopting this collaborative approach are starting to see happier, more engaged workforces, better creative solutions to their challenges and higher shareholder returns. What’s more, companies who use coworking tend to attract - and retain - the best talent, who are keen to embrace a progressive attitude to working, be it at home, in the office or at a coworking location. With new coworking locations never more than a few streets away, another big advantage of using coworking space is that it gives companies flexible space to easily expand without long term commitments. It allows your staff (or suppliers, contract workers, visiting colleagues for that matter…) to plug in and crack on with business wherever they happen to be. Traditional landlords are now reacting to this changing real estate market by repurposing their surplus space, turning it into coworking offices to add flexibility to their real estate strategy, as well as generating new business revenues. 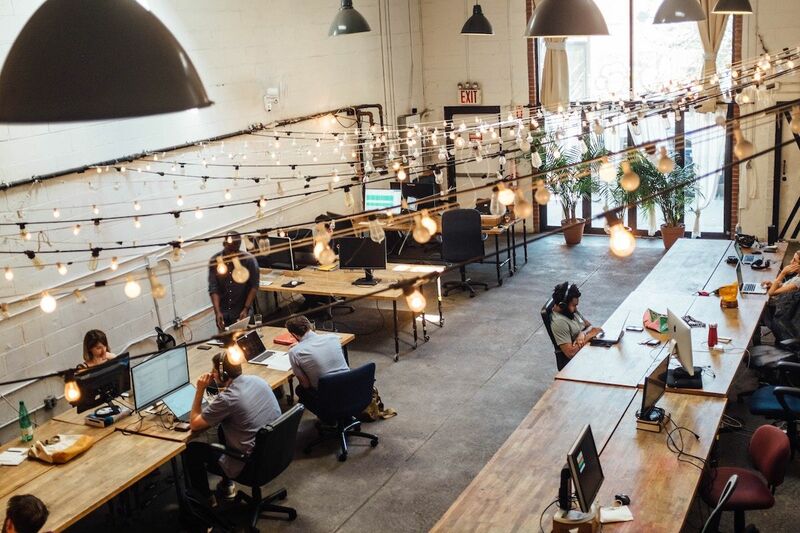 However, larger organisations require more space, more often and for greater numbers of staff, so they’re turning to dedicated service providers who can source, shape and fit out coworking spaces tailored to their specific needs. Typically, companies are forward planning to meet their existing requirements while creating space options for future growth by incorporating sizeable coworking environments that can become their overspill zones once staff numbers grow to meet capacity. Deals can be crafted between clients and service providers that are creative and will take future requirements into account, as well as the current needs of an organisation. This is why Offices iQ was established - to help source flexible workspace for corporate and enterprise businesses, by finding the right space in the right location at the right price globally. And above all we are impartial and have years of experience, therefore we are able to shape and deliver the best deal to meet your existing requirements now and into the future. Whether it be coworking for one person in Beijing or 20,000 sf of bespoke space on flexible terms, Offices iQ is best placed to provide the widest range of options.